Sourcemap has the only visualization software designed specifically for supply chains. It works out of the box to visualize massive spreadsheets in seconds, or it can be configured to import data from SAP/Oracle to give a real-time view of inventory and performance. 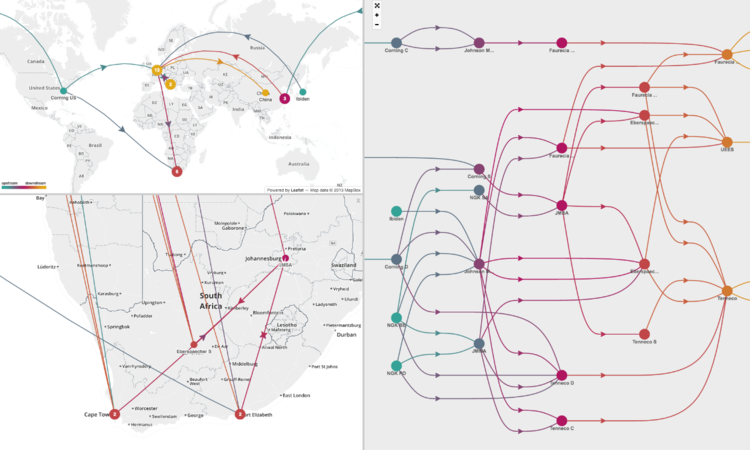 Automatically geo-code thousands of supply chains nodes using parallel processing and visualize against a variety of heat maps and geographic base layers. Quickly identify bottlenecks and sole-sourcing thanks to a proprietary network visualization. Click on any node to trace chain of custody; collapse by shipping lane or explode to see each and every transaction visualized. Unlimited tiers, unlimited nodes, custom names and colors. Upload custom metrics and search terms for advanced pivot and search in real time. Configure the metrics to be visualized by color or by size, reflecting the max/min/average or sum of a cluster. Export search results in Excel or grab high-resolution screenshots for board-ready visualizations.